EPA Administrator Scott Pruitt at a meeting earlier this month. Scott Pruitt’s longtime mentor all but joined the chorus of voices calling on the Environmental Protection Agency administrator to resign as an unrelenting series of public corruption accusations stretches into a three-month fiasco. 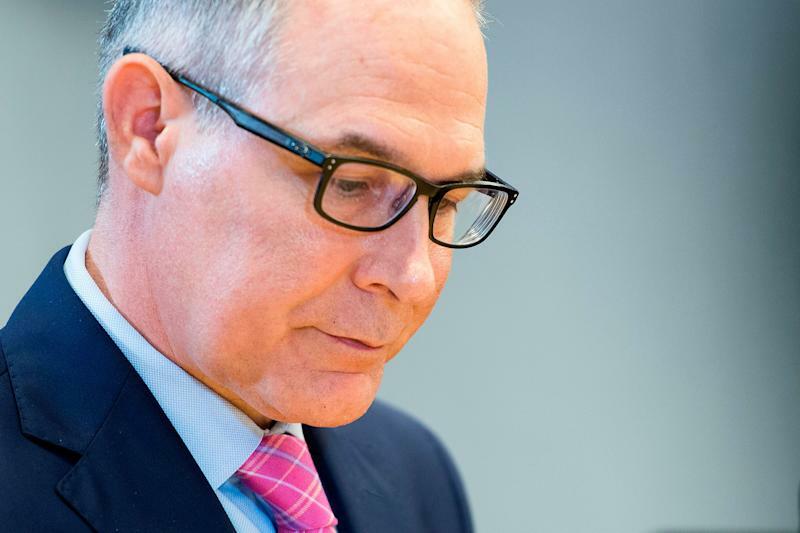 The denouncement comes as a significant setback for Pruitt. Inhofe, an adamant supporter of Pruitt’s deregulatory agenda, represents his home state of Oklahoma, and the two were so close Pruitt was long said to be considering a run for the Inhofe’s Senate seat when the 83-year-old retires. Ingraham, a Fox News host and influential booster of President Donald Trump, said Pruitt was “hurting the president” with extravagant spending and embarrassing personal revelations that he ordered aides to buy him a used Trump hotel mattress and track down his favorite moisturizing lotion at a hotel. “The interview this morning was very much the same things the senator has said before in the halls — that he has concerns about the reports and wants to hear about them from the Administrator,” she said. 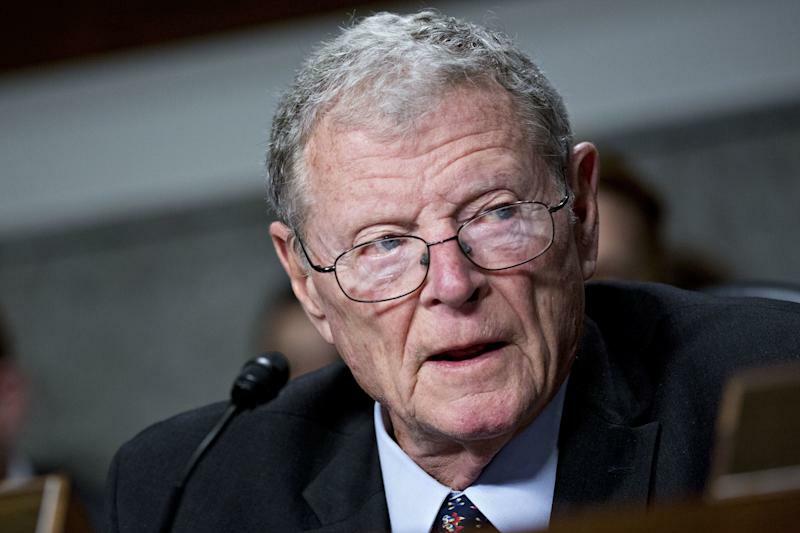 Sen. James Inhofe is a Republican senator from Oklahoma. Then, on Wednesday evening, the National Reviewpublished an unsigned editorialdemanding Pruitt’s resignation, a crushing blow from a conservative magazine that repeatedly defended the administrator andglorified himon the cover of a December issue. The public calls mark a low point for Pruitt as newly public congressional testimony and a trove of his aide’s emails released under a Freedom of Information Act request yield new revelations almost daily ― sometimes more. The details range from the odd and humiliating ― themattress, thelotion, Pruitt’s penchant for ritzy restaurants and high-priced finger foods from upscale grocers ― to the legally dubious, including deploying his political sway to nab wife Marlyn Pruitt a job, first by setting up a call with the chairman of fast-food chain Chick-fil-A, and later by connecting her with the chief executive of a nonprofit conference where he then spoke. On Friday, six House Democratsurged the FBI and the Department of Justiceto open criminal corruption investigations into Pruitt over his use of his office to enrich his wife. On Monday, a liberal watchdog groupfiled a formal complaintwith the Office of Government Ethics requesting a probe. Then, by Wednesday, the scandal worsened asthe Washington Postreported that Pruitt enlisted an aide and former donors to get his wife, a one-time school nurse with little political experience, a job at the Judicial Crisis Network, a right-wing political group. Pruitt is already the subject of at least a dozen federal investigations from the EPA inspector general, the Government Accountability Office, the White House and the House Oversight and Government Reform Committee. Last week, House Republicans blocked two separate attempts to rein in Pruitt’s ethical lapses via a bill to fund the agency, rejecting one amendment to require more increased disclosures on the administrator’s travel and another to grant the EPA’s Office of Inspector General the full budget it requested. Speaking on Wednesday, Inhofe offered an alternative. In April, the Senate voted to confirm Andrew Wheeler, a former coal lobbyist and Inhofe aide, as the EPA’s deputy administrator, putting him next in line to become the de facto agency chief if Pruitt departed. Wheeler would need to be confirmed in another Senate vote to permanently replace Pruitt, but the federal government’s acting rules are complicated and riddled with loopholes that give the White House leeway over who commands an agency in the absence of its Senate-approved chieftain. Wheeler is an ardent climate change denier who, in 2010, suggested the EPA could “reconsider” the so-called endangerment finding that established carbon dioxide as a harmful pollutant legally required to be regulated under the Clean Air Act. The finding serves as the legal undergirding of the federal government’s efforts to combat climate change. Before joining the EPA, Wheeler worked as a lobbyist for Bob Murray, the coal tycoon wielding unprecedented influence over the Trump administration’s energy and environmental agenda. This story has been updated to include the National Review’s editorial.